I knew I loved yoga (asana–the moving part–warriors, hand balances (not so much), back bends, deep twists and deep flexion poses…extreme, yeah!). Moving with “spiritual music”, rock-stars for teachers, “we are all one” philosophy, how could you not get hooked when you are a God-defying dancer who is “looking for more”. There is a magazine for “us” called Yoga. I used to read that monthly periodical cover to cover, knowing that I was a better person for reading and believing so much of it. Yoga as a I knew it was great, until I took a weekend workshop (I spent thousands of dollars on all kinds of yoga workshops). Half way into the weekend workshop (this was year 3 that we participated in this “prestigious” workshop), I posed in a magazine-cover-version of warrior for what seemed like 15 minutes in a 110 degree room with 40 other sweaty yogis and the teacher yelling at us to take it–to embrace the exorcism of our weaknesses, embrace the inner warrior–then POP, my right knee could no longer hold me upright. Today I am grateful for that POP. I am grateful that I can no longer bend my right knee past 90 degrees. I am grateful that my knees bother me on hikes in Yosemite. I am grateful I cannot wear cute high heels. That POP represented a transformation that sent me seeking again. I somehow knew that yoga was inclusive and not exclusive (because I would no longer be able to participate in those physical yoga workshops without hurting myself). I somehow knew that there were yogis who did not have “perfect skinny bodies”. I somehow knew that yoga was more. Time marches on and the yoga seeker again kept spending money on the right yoga for me. A dear client mentioned that there was a program in LA at LMU to become a yoga therapist. This was it! I found the yoga for me! I was going along blissfully to this 2 year course when one of the teachers in the program challenged all of us yogis in the classroom to give a definition of “yoga”, to define “what do you want from yoga”. He asked if we knew the history of yoga. He asked if we had studied Patanjali’s Sutras, the authoritative source of yoga. “If it’s not in the Sutras, it probably is not yoga”. What? What have I been studying all these years? Long story short, this teacher shed light on my yoga world and has been my teacher for 4+ years. I am a student–a life long student of Patanjali’s Sutras. The Sutras is a life long study and I love it. Come join me in this lovely journey of wisdom. Last weekend we hosted my yoga teacher, Robert, and his lovely wife Eleni and their sweet dog, Ruby. In the preparation for company, I went into my Vata/Pita tendencies of fluff and fufe. The studio had flowers, food, and folks. Thank you all! 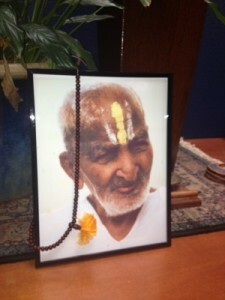 Robert, besides his wisdom, bestowed a framed photo of the founder of our yoga lineage, T Krishnamacharya. It is a gift to remind us “to teach what your teacher taught you through your experiences as appropriate to the student”. It is also a reminder that we are a part of a lovely yoga lineage. The weekend was incredibly thick with info and insights. You probably noticed that we have lovely new flowers in the planters. Then one of our sweet clients, Pat, hacked the large weeds around the building to submission. Another Tone angel, Tony, brought his tool belt and added lighting to our street display case–solar no mind! Our sweet Katie, ordered a memorial plaque in remembrance of our Beverly Crownover-Keefe, a dear client who was our official greeter and supporter for over a decade. Bev passed less than a month ago and will be forever remembered with fondness. The plaque now lives on the end of Reformer North. Have you also noticed our incredible front desk staff stepping up and greeting you with warmth and sincere intent on assisting you? Have you noticed our teachers being incredibly creative and brilliant? “Have you noticed” how wonderful Tone is! https://www.tonefitness.com/wp-content/uploads/2018/04/tone-logo.png 0 0 monica https://www.tonefitness.com/wp-content/uploads/2018/04/tone-logo.png monica2013-10-01 10:03:512013-10-01 10:24:48Have you noticed . . .
My Yoga Teacher is coming to town! I am so excited! The weekend of September 14/15, my yoga teacher from Southern Cal agreed to come up to teach 2 workshops. Robert has been a student of yoga in the Desikachar/Krishnamacharya lineage over a decade. He studied with Mr. Desikachar at the KYM in India and is one of a handful of teachers who is certified to teach teachers. He has written several published yoga articles and his book on Yoga and addiction is set to be published soon. Robert , his lovely Ayurvedist wife, Eleni, and their sweet dog, Ruby will be our guests in beautiful Sonoma County. ( Clare, Tone’s Yoga Team Leader, thinks he looks like Robert Downey Jr.–I think my teacher Robert is smarter and funnier.) If you are interested in yoga or love yoga, Robert’s first workshop will put yoga in the context of world history–what it originally was and why it is India’s gift to the world. The second workshop will be Sanskrit 101. Learn to read, chant this language of yoga. Learn what OM really means! I am going to be a yoga student for the rest of my life in this lineage. Come and get a glimpse why. Yoga is for everyone and provides hope. You will learn more about yourself and you might even learn to love yoga as much as I do. https://www.tonefitness.com/wp-content/uploads/2018/04/tone-logo.png 0 0 monica https://www.tonefitness.com/wp-content/uploads/2018/04/tone-logo.png monica2013-09-05 06:31:482013-09-25 10:53:59My Yoga Teacher is coming to town! Welcome yogis and yoginis (the names for the male and female yoga practitioners, respectively). Congratulations, because, as of today, you are now practicing yoga. Showing up for your first yoga class is all that is required for you to now say proudly to your friends, “I am doing yoga!” This is an exciting day, and you may be full of questions, and possibly even have some fear as you begin your yoga adventure. So I’ll do what I can to assuage your fears with the following FAQs about attending your first yoga class. I’ll cover everything from what to expect to what gear to wear to what you can do. Q) When do I show up? A) It’s a good rule of thumb to show up ten minutes early to your yoga class. Not only does this ensure that you will get signed in on time, but it gives you the chance to change gears even before you get on your yoga mat. I like to say that sitting dow n on your mat is the first step in the transition turning you from a “human-doing to a human being,” and not feeling rushed on your way in to class helps ease that transition. If you do find yourself late for your yoga class, it is generally OK to come in quietly so as not to disturb the other students as they are transitioning as well. If you come in late set your mat up as simply and quietly as possible, and know that you can ask for all of the other props as needed. If you are later than 15 minutes, it is a good idea to just come back at another time, as the class is now warmed up, but you are not. At Tone, we know your life is busy, and many of our yoga classes start at 10 minutes after the hour, just so we can get you in there on time! Check out our schedule so you can plan ahead. A) As yoga clothes go, form follows function. You want to be in comfortable clothes that move with you. Sweatpants, yoga pants, T-shirts, and tanks made of breathable material will support your practice. Yoginis, it is really helpful to have a comfortable sports bra in your wardrobe. You will most likely be lying on your back at some point, and getting poked by a hook or bra clasp is not relaxing, to say the least. Many of our male yogis are comfortable wearing compression shorts underneath their sweatpants or workout shorts. Bare feet are optimal for stability, b ut if you have orthopedic issues, you are welcome to wear whatever supports your feet to their comfort. It never hurts to have a few really nice “yoga outfits” in your closet. Fun and comfortable yoga gear can even inspire you to get yourself into class. Tone is a licensed Lucy Athletic wear retailer, so if you want to treat yourself to some new yoga duds, check out our yoga apparel and gear collection. Q) What do I bring? A) An open mind, a willing body… oh wait, you mean literally, don’t you? As you are just starting out on your yoga journey, you may not have your own mat, blocks, straps, and so on. No worries! Tone is fully equipped with lovely mats, b locks, straps, eye bags, bolsters, and much more to keep you equipped throughout your class. We do not charge a rental fee, all that we ask is that you clean the mat (we provide mat wipes) when you are finished with it. That said, it is very satisfying to have your own yoga accessories. I have found this to be true in my practice. 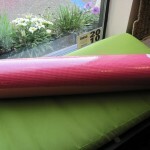 I have fallen in love with my Jade yoga mat. It is the perfect density and material for me. There is something very comforting about having your own little rectangle of yogic joy and safety wherever your travels take you. Tone is a licensed Jade retailer, and I cannot recommend them highly enough. We also have all of the other accoutrements, blocks, straps, eye pillows, and more in our Yoga Apparel and Gear page and you’ll find all of these products are especially helpful in establishing a home practice. A) Have no fear, Tone yoga teachers all speak English (and some of us also speak some Spanish and ASL) and we’re also able to pronounce the Sanskrit names of the Asansas (definition: a pose comfortably held). Although we may say “Utkatasana to Uttanasana,” we will also explain that what we’re saying means Chair Pose to Forward Fold. We are more than happy to explain or repeat the name of the Asana. None of the other yogis in the room were born speaking Sanskrit, so enjoy the learning process. You will be surprised how quickly you begin to understand the lovely lyrical Sanskrit words. Let us know when you tweet #justbreathinginsavasana. Q) I am: Injured, osteoporotic, nervous, stiff, elderly, a teen, brand new to yoga… and more. Can I still practice yoga? A) Yep. Yes. Si. Mmm-hmm. You can practice yoga. 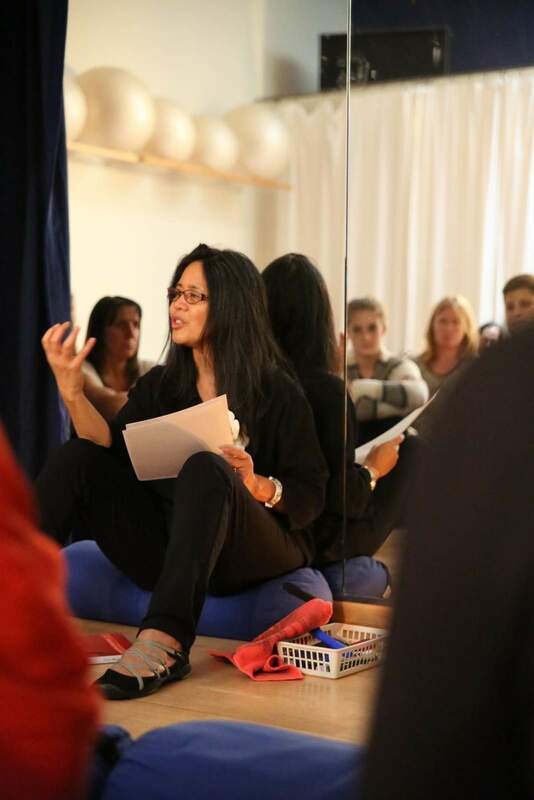 Tone Studio is unique in that all of our yoga teachers possess a wealth of knowledge about the human body and its myriad of complications, functions, and issues. In fact, all of our Tone yoga teachers are also Pilates teachers, and have spent hundreds, if not thousands of hours studying the human body. It is strongly recommended that you voice your concerns to the Administrative Consultants at the front desk regarding your specific issues. They can then inform your teacher, or they may suggest that a private yoga session would be the best way to assess and address your specific needs. Click here or speak to the front desk if you are interested in a Private Yoga Session. Do know that if you have an acute injury or serious condition, you should follow your health care provider’s advice for your activity-level guidelines. Your yoga teacher will most likely ask if anyone in class has an injury or condition so that she may help you modify your practice. Arriving early to your class will also give you the opportunity to talk to your teacher about any of your concerns. 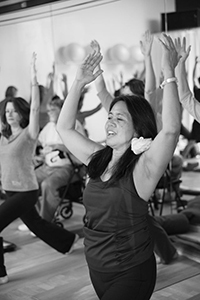 Your yoga class meets you where you are, with your needs at the center of your practice. At Tone, we strive to support you in your unique yoga journey. If you have any other questions regarding your yoga practice, please contact me at clare@tonefitness.com, and you can also check our FAQ’s page for more information. We look forward to doing yoga with YOU! Okay, it is official, this “Book Club” is actually a deep delving into the concepts of the beautiful book, Heart of Yoga by TKV Desikachar. It’s not the completion but the experience and process! The yogins who came are in for the long hall. If you were present today–bless you for your clarity and courage to step into this in depth study of yoga. If you are planning to come, COME! We are creating a community of “like minded folks” based on this incredible pithy book. We wallowed in the quotes from page 6 and 7. Check them out. 1) Read the introduction through to page 17. 2) Come up with a real example for each of the following. Look, we are learning some Sanskrit too. I am so grateful for this opportunity to experience this book another time. Wisdom is so amazing. I am so excited to read and discuss the Heart of Yoga with everyone! This will be the upteenth time that I have gone through this loved simply written manuscript. It uses simple language to describe and discuss depth defying principles of yoga. Every time I bring out my kindle version or my lovely 10 year old signed copy of Heart of Yoga, a child-like smile emerges from my soul with the anticipation of jumping into a luscious “new” book–the principles presented are always revealing new and appropriate gems to incorporate in my life. Click here for more details about this book club event. “I really want to try yoga, but I am: too stiff, too injured, too old , too busy, too impatient, too uncoordinated, too unbalanced, too self-concious….” As a yoga teacher I have heard variations on all of these themes. And my answer is generally, “ I can totally relate!” Especially before, and even while participating in, a yoga practice, all of these feelings may surface. When we take the time to notice the sensations of our body and mind, to become a witness to the vessel that we inhabit, we can become self-critical. Our busy brain analyzes the creaky knee as, “Well, I am just falling apart here.” Our wobbly warrior makes us think, “I am so clumsy!” We catch ourselves inhaling as the teacher says exhale and internalize, “ I can’t even breathe right!” These are the stories that we tell ourselves that may prevent us from ever getting on the mat, and then, once we are practicing, the stories that still haunt us, and shame us, and get under our skin. And yet, your yoga practice meets you exactly where you are. Your yoga practice lives in your unique body with all of its “charms” and in your heart, and busy brain, and breath, and intentions. You having a yoga practice is not “You doing Yoga” , but instead, “Yoga doing You”. Imagine if you walked into a bookstore and saw on the shelf, “Yoga for People with Stiff Knees, Short Breath, and an Old Shoulder Injury”, or “Yoga for People who are frequently Bored In Yoga Classes, Fall Over Easily, and Have Carpal Tunnel Syndrome”. Would it make you realize that you, even you, could do yoga? Your yoga practice’s purpose is practice. What? I’ll say it again, your yoga practice’s purpose is to get you to practice. You practice breathing easily and with intentions, you practice balance, you practice replacing negative thoughts with positive ones, and Everyone (especially you) can do this. Have you ever heard of a “Yoga Perfect”? Nope? Me neither, because it is a Yoga Practice. We began the 30 days of Yoga at Tone to encourage this practice. We believe that committing to a daily practice for thirty days will begin to enact all of the lovely benefits that yoga can provide for you. When you practice regularly at anything, you become more at ease with it. Easier breath, easier mind, easier heart, and who knows, maybe easier knees and hamstrings. It is also heartening to look, or listen to the breath around the room, and witness your fellow practitioners working to invite positivity, and release that which does not serve them. It is our hope that the completion of thirty days of practice puts that little spring in your step that encourages you to keep on walking into your yoga practice. Need more convincing that yoga is for you? I did! Try a Private Yoga Session with one of the Tone teachers, (also offered in our Warrior III package) and they will work with you to design a yoga practice that has your name and your needs on it and in it. Having a personal yoga practice designed for me feels like an incredible luxury, that I take with me always, and use whenever I need it. Tone Yoga teachers all love a challenge and have never been stumped, so don’t be shy, be specific about your needs, and you will walk away with a practice that will have you eager to roll out your mat and get practicing. We are honored that you have chosen Tone to serve your yoga needs in your yoga practice, and we would love you to join us in your 30 day commitment. As my (and your) Yoga teacher, Monica Anderson says, “Yoga is Sustained Joy for You!”, so let’s en-joy practicing together!